A week's holiday in New Zealand gave enough photos to warrant a new section. I've divided the birds into three categories: native, translocated (native, but moved elsewhere in the country) and introduced. Where applicable, I've included the Maori name for each bird. 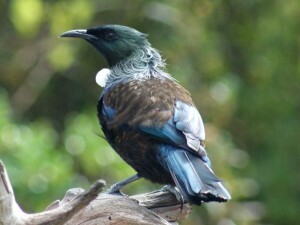 The native birdlife of New Zealand is a mixture of species unique to NZ, birds that exist in several countries and recently self-introduced Australian species. Unfortunately, many New Zealand species are close to extinction, or have been rescued from the brink. Many species are highly vulnerable to introduced predators such as rats, stoats and possums and their survival depended on the remaining populations being removed to predator-free islands and reserves. Many species of bird have been introduced to New Zealand from Europe, Australia and elsewhere. In some cases, they compete against native species, whereas others have found empty ecological niches. H. Robertson and B. Heather, Field Guide to the Birds of New Zealand, 2007. L. Svensson, K. Mullarney, D. Zetterström and P. J. Grant, Collins Bird Guide, 1st edition, 1999. K. Simpson and N. Day, Birds of Australia, 2004. NZBirds.com - interesting site on the bird life of New Zealand. Supporters of Tiritiri Matangi - describes one of New Zealand's most important and most accessible reserves for endangered NZ species. Miranda Shorebird Reserve - one of the best sites for waders and much more in New Zealand.